Using mathematical calculations to determine the true radioactive exposure to millions in Japan, a European Union study has determined that just 3 months following the 2011 Fukushima Daiichi disaster, the land area larger than 20,000 square miles around Fukushima was contaminated with radioactive nucleotides. Cesium and radioactive iodine were among them. As were other radioactive elements, and Canada has now found cesium 137 in their water supply. Sadly,more than 43 million people in Japan were likely exposed to these cancer-causing elements. These radioactive substances still pour into the Pacific to this day, as determined by a team of scientists in Japan. The EU study is clarified by a Science for Environment Policy News Alert. It explains that the study calculated the atmospheric deposition of the two radionuclides using a widely respected circulation model and focused specifically on emissions in gaseous form. Factors such as precipitation, wind patterns, particle sedimentation and radioactive decay were also taken into account. 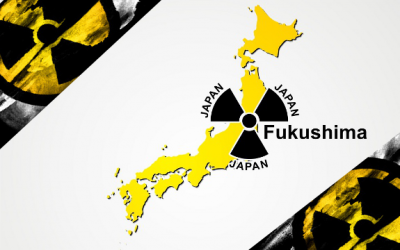 Conservative estimates calculate that over 34000 square kilometers were contaminated with more than 40 kilobecquerels per square meter of the two radioactive substances – cesium and iodine. This level is considered by the International Atomic Energy Agency to be the threshold for what is considered to be “contamination.” It is far from safe for human life, or animal life. It is also worth noting that government agencies keep monkeying with ‘acceptable levels’ of radioactive exposure to lessen their responsibility in poisoning the planet. Based on the EU report’s assessment, more than 10 million people living in this contaminated land space are effectively poisoned by radioactive particles, including many who live in the nation’s capital, Tokyo. The rest of the radioactive cesium was blown – guess where – to the West Coast. More than 80 percent of it is expected in great plumes of coastal winds and, of course, through our ocean. The polar vortex we have been experiencing doesn’t help. For example, double the amount of radiation was recently found in Missouri snow. This particular study only looked at cesium and iodine particles, and not other radioactive contaminants. And other experts are still assuming a much larger contamination area than 20,000 square miles. Some say a more realistic figure is twice that size. This means simply, what many of us suspected, that the true level of contamination has been swept under the secrecy rug so that the nuclear power industry can continue their irresponsible money-making. Our own government is still putting money into nuclear power – after this incident, it is beyond egregious, it is mass-murder.